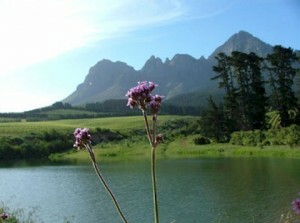 The Helderberg Mountain is found in the Western Cape of South Africa in the town of Somerset West. The mountain stands alone with 3 distinct peaks in the middle of the town. 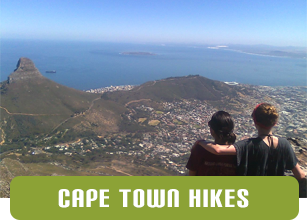 Clearly seen from the top of Table Mountain it offers some wonderful hiking with some of the best views of the area. Once through the gate the first hour is a straight forward slog up a jeep track. Just keep heading up the hill. Eventually you walk into a beautiful gorge and follow a stream for a short distance before heading to the right and across the river. The path is now quite small and zig zags up the mountain steeply until it reaches a shoulder. Here you need to follow some cairns as the path comes and goes between the rocks. 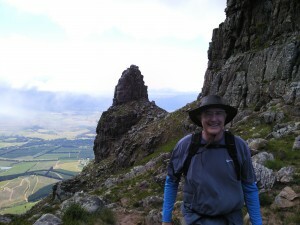 It leads you on a fairly precipitous route up and onto the shoulder on the right of West Peak. You should take about 2 hours to get here. Once on the shoulder you can either go left and up West Peak or right and take the longer and more challenging route up the Dome. 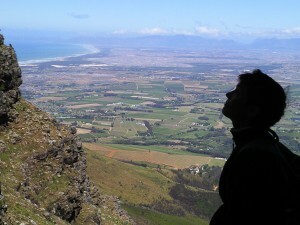 The path to the Dome is quite clear.It now leads you around the Cape Town side of the mountain on a traverse above Stellenbosch. The views are amazing. The path remains quite clear for about 40 minutes until you reach a cairn and the path disappears. Here you head up the steep erosion path to the next level. The path is rocky and tricky in places but after about 30 minutes you reach the neck, and cannot not be amazed by the sheer cliffs towering in front of you. 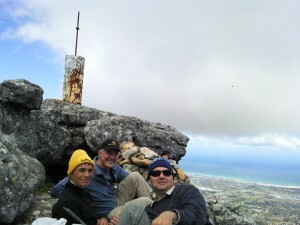 Getting to the top should take you around 4 hours if you maintain a good pace. So start early. 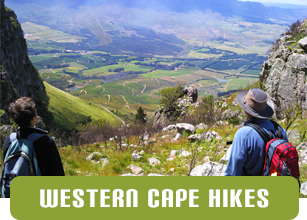 Ridgway Ramblers offer a variety of guided hikes in the Cape Town area. 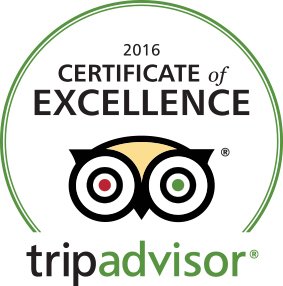 Join us to see the best the Cape has to offer.